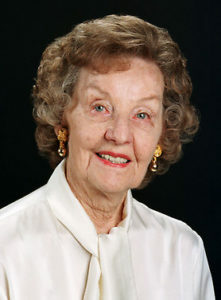 Ruthe Deskin lived in Nevada for almost 88 years and spent most of her life working with newspapers across the state. She was born in Yerington, Nevada and worked delivering newspapers as a youth. Following her high school graduation, Deskin went to the University of Nevada, Reno and worked on the school’s newspaper, The Sagebrush. After she finished her education, Deskin went to work at the Reno Evening Gazette. Deskin moved across the state in 1950 and settled in Las Vegas where she began working in a new medium, radio. She worked at the Las Vegas radio station, KENO and helped write on-air advertisements. She left radio after four years and went to work at the Las Vegas Sun with editor Hank Greenspun. Deskin and Greenspun shared a close relationship and she worked at the Las Vegas Sun for nearly fifty years. During her time at the Sun, Deskin wrote columns that championed the rights of women, children, seniors and those neglected and abused. She wrote a front-page column for many years called “ Memo to Hank.” Her last column, “Back and Forth” was published until a month before her death at age 87. Deskin also served as an assistant to Hank Greenspun and to his wife, Barbara, after his death. In 1984, she was honored by the Nevada Press Association and won the Silver Makeup Rule. Deskin was committed to the Las Vegas community and worked continuously to improve the quality of life of Las Vegas residents. She was co-founder of the Sun Youth Forum in 1956, a program to give high school students a voice in the community. She also co-founded Child Haven, a facility for abused, neglected or abandoned children in Las Vegas. She worked to increase support for Child Haven throughout her life. Deskin also worked with the Juvenile Court Services, was a member of the Child Welfare Advisory Board, and served as director of the Spring Mountain Youth Camp. Ruthe Deskin passed away on February 14, 2004 after a lengthy battle with a heart condition.